A set of samples of an Acoustic Bass, an old Ibanez sampled years ago. Custom scripted in Kontakt 5.4 (Requires Kontakt 5.4.2 Full - won't work in Kontakt Player) . 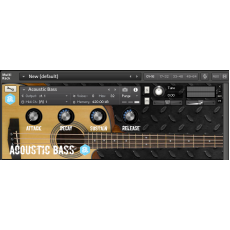 There are three presets: a fingered bass, a muted bass and a picked bass.